An insightful Day Two of the FAB 2018 conference invited delegates to think outside the box and offered tips for preparing for the future. The airport food & beverage sector has come a long way in recent times, to the extent of being hailed “the new retail”. But there is still a long way to go, and many changes are happening already, as delegates discovered on Day Two of the FAB 2018 conference. Technology, engagement, the human touch, and creating memorable experiences were just some of the topics discussed. The day began with a look at how change can be affected on an individual basis – through the actions of front line service staff. Uplifting stories of humanity, warmth and exceptional customer service were recounted as the five finalists in the FAB Team Member of the Year Award were profiled and honoured. In discussing Manchester Airports Group’s (MAG) new in-house F&B concept called 'Proof', Executive Vice President of Business Development & Lounges Beth Brewster said that it was a perfect example of innovating and having no fear. “You have to test and try things and offer proof of concept,” she said. Proof is designed to focus on “fresh, high-quality food alongside a superior, spirits-led, drinks menu”. The concept is being rolled out at East Midlands Airport this Summer and will then be introduced at other UK airports, Manchester and London Stansted. Proof could be widened to F&B units outside the passenger lounge in the future, according to Brewster – if the imaginative and fearless approach pays off. The five finalists in the FAB Team Member of the Year Award. 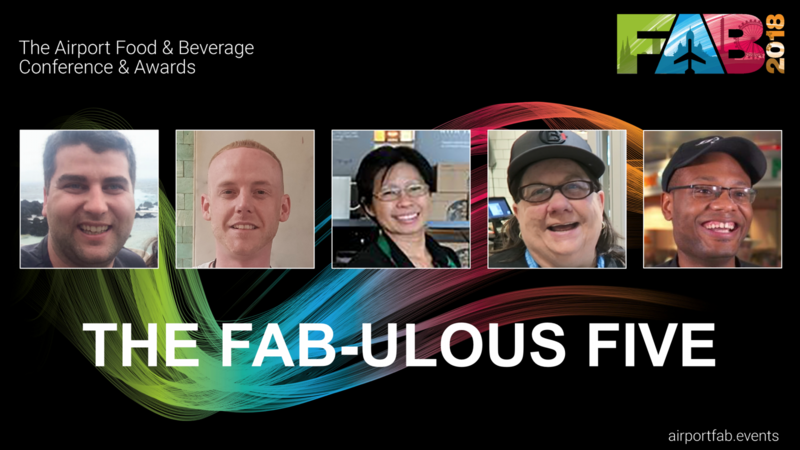 The five finalists in the FAB Team Member of the Year Award were: TRG Concessions’ Fabio Azevedo Dos Reis; SSP UK’s Darren McLean; HMSHost North America’s Lily Olson; Dallas Fort Worth International Airport’s Carolyn ‘Suzie’ Grider; and SSP America’s D’Angelo Charles. Each of the finalists received a Highly Commended award and one was named the overall winner. Beth Brewster: "We decided to give it a go and own the touchpoint." Sarah Naqvi: "IT leaders are becoming embedded in organisations, they are front of house and driving change." Embracing technology also requires a fearless approach, and that was the subject of the first panel session of the day. HMSHost North America Executive Vice President and Chief Information Officer Sarah Naqvi noted that technology was a key facilitator of establishing new customer touchpoints. But creating experiences is just as important as using technology, she explained. “Millennials are ready to pay more for experiences and want to attend live events,” she said. They are also concerned about the quality of food. She also noted the importance of the ethical use of data, which turns into vital information and intelligence. Naqvi called for stakeholders to share information in order to give customers the experiences they are looking for. George Moore: "Some of the new brands are first to region, such as Jamie's Deli." Bahrain Airport Company Vice President – Non Aeronautical Revenues George Moore discussed the new concessions programme at Bahrain International. It reflects modern trends, with a mix of local and international names. F&B space rose from 25% in the old terminal to 40% in the new terminal. Richard Cross: Food has to be "instagrammable". London Stansted Airport Head of Retail Richard Cross noted the vital importance of keeping pace with the latest trends. Food has to be ‘Instagrammable’, while customers are demanding healthy, authentic, locally-sourced options. Cross said Stansted is planning a street food market to meet demand for variety, while innovations such as mobile ordering and self-service are essential as dwell times shorten. F&B units were benefitting from Grab’s mobile ordering service, while self-service kiosks allowed "guilt-free" ordering. Steve Johnson: "Passengers want a piece of the city they are in. Local products are becoming more important and marketplaces more popular." But he reiterated that technology should be used to enhance the passenger experience and not replace the human element. “It’s important to always be aware of what the consumer wants, and not what we might want,” he said. Expanding on Millennial trends and the use of social media, Johnson noted that the element of showing-off was almost as important, if not more so, than the experience itself. Finally, wellness is increasingly in demand, and HMSHost has responded by creating a standalone wellness concept which it will roll out across its network. The session was followed by an introduction to new data analytics company Moodie Insights by General Manager Craig Mackie. Big Data does not have to be rocket science, he said, and can actually be harnessed by F&B companies to improve the commercial offer, in real-time, by reacting to customer behaviour. “The challenge of information is how to integrate it into the daily operation,” he said. “This challenge is most acute in the airport environment. “There is a huge diversity of people coming through the airport, and an understanding of this can help grow the business. Heidi Köpple: "These concepts demonstrate the benefits rather than the constraints of being in an airport environment." Thinking out of the box was the subject of the next session. Zürich Airport Head of Commercial Centres Heidi Köpple discussed some of the Swiss hub’s best and most innovative concepts. These range from Air, which celebrates the feeling of being at an airport restaurant, to food helicopters (rather than trucks), pop-ups, and an outdoor terrace. Köpple also noted the success of Yooji’s, a famous chain in Switzerland which serves sushi. The airport has brought it to a variety of gate areas and Köpple said sushi had proven to be the ideal product to be taken onboard the plane. “These concepts demonstrate the benefits rather than the constraints of being in an airport environment,” she explained. Mustafa Al Hashimi: "There has been a focus in Dubai on unearthing local talent through food festivals." Mustafa Al Hashimi, Co-Founder of fast-growing sector newcomer, Dubai-based HWH Hospitality Investments, said the emirate’s story had helped inspire his company to think differently. “HWH has created nine brands that each have a unique selling point, and are attracting different customers,” he said. Key ingredients to a successful concept are stories, emotions, a key attraction, a defined purpose, and customer engagement. “Dubai Airports has seen an opportunity to introduce an independent operator and have brands with a universal appeal,” Al Hashimi said. Deema Anani: "There have been changes in dining habits outside the airport, which affect us in the airport." Deema Anani, Commercial Director at Amman Queen Alia International Airport, said thinking outside the box was a mindset and was about making small changes that can have an impact. She also noted the importance of looking outside the airport environment to assess changing customer behaviour. Her big news though was to announce that the Jordanian airport is to launch a F&B tender in late 2018 for a master concessionaire. Anani noted that Amman Queen Alia International is emphasising innovation and Sense of Place in the tender. “We have the vision already and want to work with a partner to help us achieve it,” she told delegates. FAB Cooks! (From left to right) Marko Palovaara, Nick Inkster, Jussi Laakso and Mika Roito. Up next was the return of FAB Cooks!, a live cooking demonstration with interactive discussion. SSP CEO Nordics and Spain, Group Director Strategic Client Partnerships Nick Inkster introduced two of Finland's finest chefs, Marko Palovaara and Mika Roito. Delegates were eager to taste their creations, which were on offer at lunch. [See our image gallery in this section for more]. Steve Collis: "Own glamour and the destination; own coffee; and own the day." Design and innovation were key elements of the next session, titled ‘New dynamics in airport F&B’. JHP Joint Managing Director Steve Collis listed a series of top talking points, including a fascinating look at bespoke ordering in airport food & beverage as part of a shift in dynamics at the modern travel hub. A growing trend is the concept of buying food at the airport to take on the plane. “Passengers want something fast, fresh and well-sourced,” he said. The use of biodegradable thermopacks also reduces the environmental impact of food purchasing. Collis predicted that self-service coffee would be the future, with technology allowing travellers to specify their requirements. Mark Bergsrud: "Digital menus drive revenue." Grab CEO Mark Bergsrud assessed the impact of mobile ordering and payment on the industry. “We must reduce the fear of innovation and turn it into excitement,” he commented. “Customers want to use their smartphones. Mobile commerce improves results, but Bergsrud said it must be rolled out in the right way. “The industry lacks an effective marketing channel. I don’t believe proprietary solutions can succeed to the extent an aggregated system can. Mélanie Guilldou: "Mixing food and duty free is about making travellers stay longer." Lagardère Travel Retail Executive Vice President Foodservice Global Mélanie Guilldou explored the connection between retail and F&B and how they are no longer always separate entities. She also introduced 'virtual waitress’ G.I.U.L.I, a service which allows passengers to order with their smartphones, pay at the table, and even upsells to them. “Travellers want to be reassured about time management,” she explained. Nick Inkster: "One size does not fit all: what you do depends on the type of airport you are." In the final session of the day, the focus was firmly, and appropriately, on the future. Where is airport dining heading? “I don’t know,” said SSP's Nick Inkster candidly. “But I do know the future will be very different.” Customers will be more experienced-based, demand quality and memorable food, and want “novelty, fizz and colour”. But, he warned, F&B companies “must not lose sight of the fact that mix and segmentation will always be the driver of what we deliver”. Angela Heuer: "Choice is more important in the airport today, the ability to get access to anything in the airport, at any time, wherever you are." Westfield Director of Business Development for Airports Angela Heuer said that food was now the anchor driving people to the company’s shopping centres. Could the same be true for airports? She also noted the challenge in presenting food given that “everything is on social media” now. But she said experience is about a lot more than just environment. “We must engage all five senses, and that takes imagination. Zenola Campbell: "We want to exceed customer expectations." Zenola Campbell, Vice President of Concessions at Dallas/Fort Worth International Airport, said F&B is vital to the customer experience, and noted the increasing blurring of the line between retail and food in outlining the airport’s concessions programme. “Everything is big in Texas and our concessions programme is no different,” she said. Campbell explained that a balance had to be achieved between so-called ‘indulgent explorers’ and business travellers. The former are “young, desperate for experiences and want engagement”, while the latter want tried and trusted national brands. Anders Barsøe called for the industry to unite over environmental and sustainability issues. David King, FAB's Convener of Judges, talked of the constant evolution in airport F&B. FAB judges David King and Anders Barsøe offered some final thoughts before the conference closed. King noted how concessionaires and airports were now much more focused on the consumer. He also reflected on fast-changing tastes and trends, such as the rise of pop-ups, an increasing emphasis on design values, and achieving the ‘wow factor’. People are vital too, he said. Staff retention is key in driving quality, while the importance of senior management getting involved cannot be underestimated. That means rigorous practices and policies and not initiatives that pay lip service, he said, noting that companies who put a great emphasis on sustainability were gaining in market value. Non-recyclable plastics should be eliminated, he said, and such campaigns would benefit from industry-wide collaboration. Food for thought, as it were, to close FAB 2018. Changing of the guard: Dallas/Fort Worth International Airport will host FAB 2019, it was announced as FAB 2018 closed. Finavia VP Commercial Services Elena Stenholm hands over to Dallas/Fort Worth Airport VP Concessions Zenola Campbell, Board Member Madeleine Johnson and Executive VP Revenue Management Ken Buchanan.